How do you sell without making the client feel like they’re being sold to? This is the question so many experts struggle with. They need to sell. But the last they want is for the client to feel like they’re just out to make a sale. 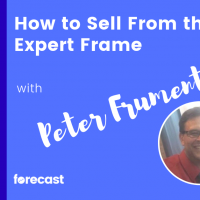 In this interview, Peter Frumenti of Sales Team 6 shares his insights on “selling from the expert frame”. When you sell from the expert frame, you’re able to get on the same side as the client and help them make the best decision (whether or not that means working with you).